Anita Elizabeth Hughes’s autobiography is split into two halves and family is a main theme. The first half of the biography focuses on her http://www.writinglives.org/home-and-family/anita-elizabeth-hughes-home-and-family such as her relationships with both her parents and siblings. The later half of the biography focuses on her later life and the family that she has of her own. Anita describes how she met her future husband at a Sunday school dance and was charmed by his awkwardness: “he just couldn’t dance” (8). Soon into their courtship the First World War broke out and and their “courting was done mostly by writing letters” (8). Due to the length of the war Anita and Frank “got married after 4 years of courtship and engagement” (9). After her marriage Anita still kept a close bond with her siblings even though she no longer lived within the familial home. She was glad to have her own home: “one of the greatest thrills of my life was to have my own key” (10). She felt immense pride at being able to live her own life outside her parents and being able to afford things on her own. Anita was still incredibly close to her siblings and when her sister Nellie died in 1918, Hughes was devastated: “This was a great grief to me” (9). There are many things that are similar between Anita’s family with her husband Frank and the life she had with her family while younger. 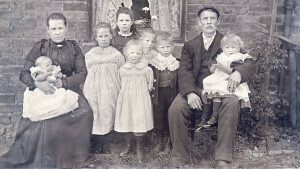 Both families are working class and struggle with money “money was scarce and we had to be thrifty” (10). A change is seen though in the difference in the number of children that Anita had in compared to her parents. She was born at the end of the 19th Century when bigger family’s were prevalent and her parents had six children. Anita had her first child in 1923 in post-war Britain and only had two children, Evelyn and Gwendolyn; a big difference to her parents. Her relationship with her daughters is a main theme of her memoir written after her husband Frank died. She discusses her grandchildren and the fact that she has moved next door to her daughter Gwendolyn. Many historians and critics believe that family is key to understanding working class life in the 19th and both centuries: “No student of nineteenth- and twentieth – century Britain can fail to appreciate the crucial role that family played in the lives of working class people” (95). Critics also identified the change which is displayed within Hughes choice in having a small number of children. The “years between 1850 – 1939 saw fundamental changes in family life… families grew…smaller” (Benson, 96). Both Hughes’s families show the change that Britain went through after the war. Benson, John. The Working Class in Britain 1850 – 1939. I.B Tauris 2003.